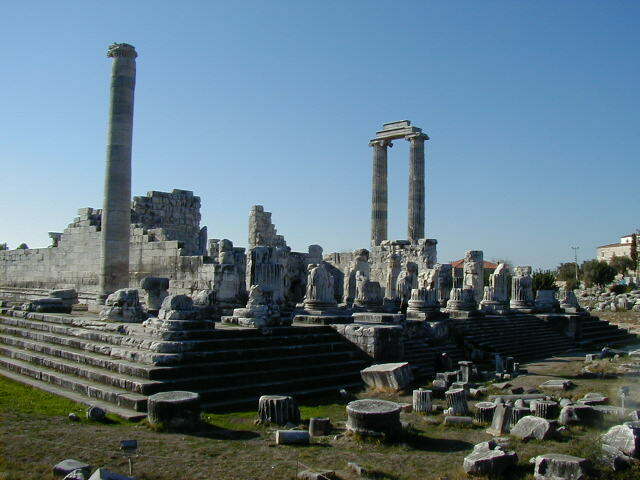 Before leaving Selcuk I paid for the one day Priene, Miletos, Didyma tour. 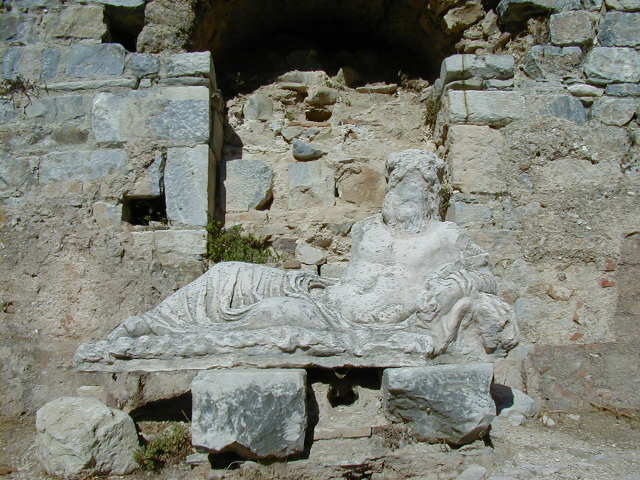 After a full day traveling to spend about an hour and forty minutes in Aphrodisias, I was willing to let someone else take care of the transportation. Tours are not as much fun as wondering around solo, but they are more efficient. Also, this wasn't a huge tour; there were only five other people and the guide. 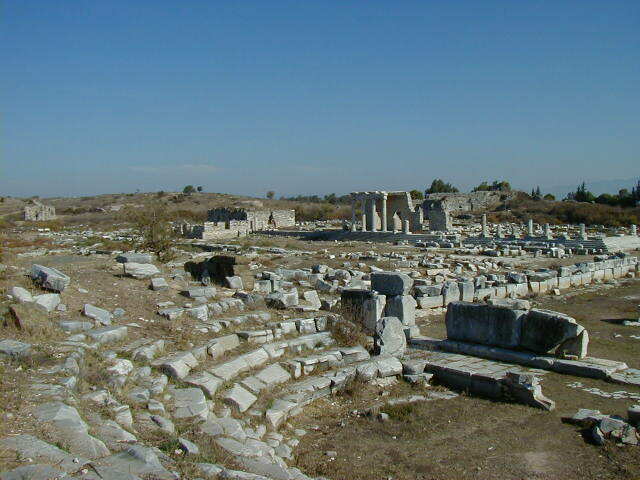 The first stop was Priene. 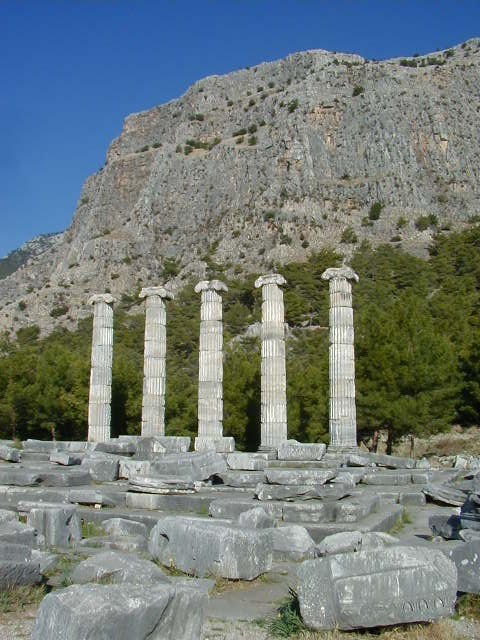 The first shot is of the Temple of Athena, with its' dramatic background. 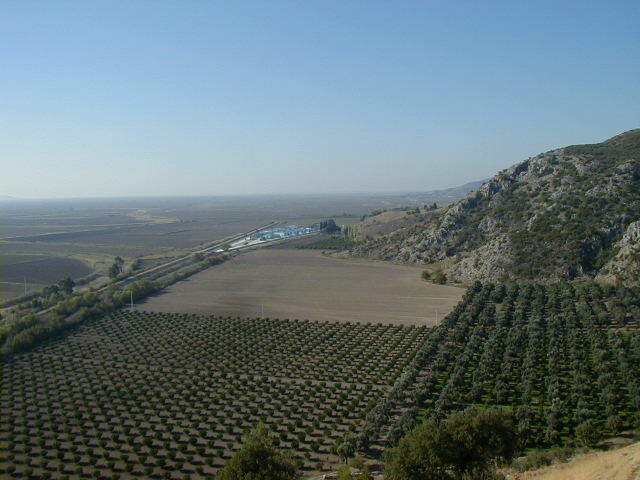 Following that is the Odeon, and then the fields where there used to be a harbor. 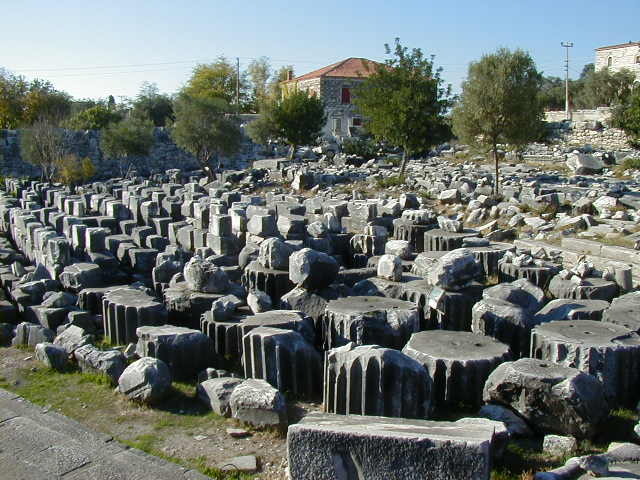 Priene is another port city that was abandoned after the river leading to the sea silted up. I can't help but think that there was some kind of climate change in Anatolia between two thousand and fifteen hundred years ago. 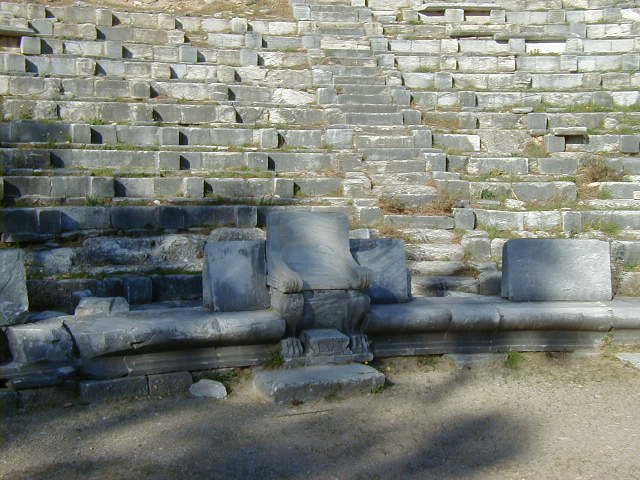 Priene had a theater, as did all good cities, with VIP seats next to the stage. 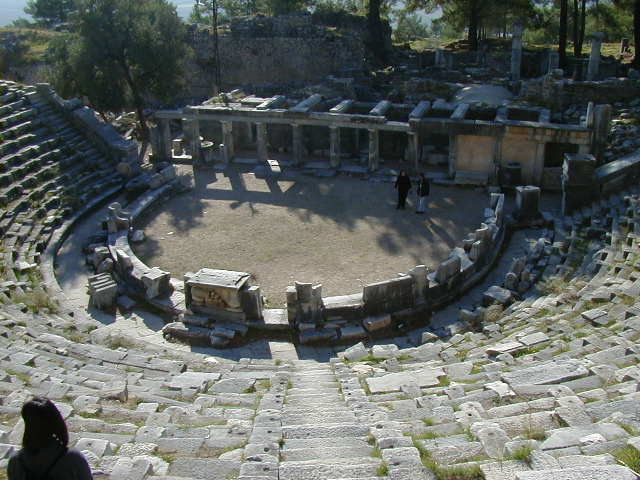 There was a Greek couple on this tour, and the woman, who sang in a choir, stood on the stage and softly sang a verse. The acoustics were excellent; I was on the top row of the theater and heard her clearly. This was the woman who warned me to never eat olives right off the tree because they are intolerably bitter. She was right, fresh olives are terrible. 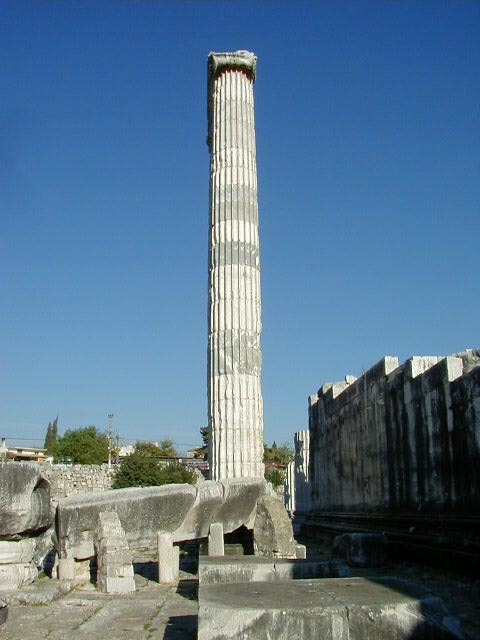 After Priene was Miletos. 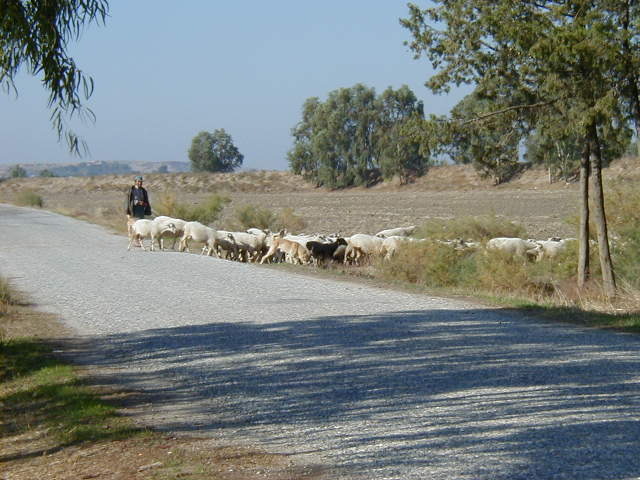 At the entrance I saw a shepherd, his dog and a flock of sheep. I'd seen this same thing many times in Romania, Bulgaria and Turkey, but this was the first time I had my camera ready and could take a shot. 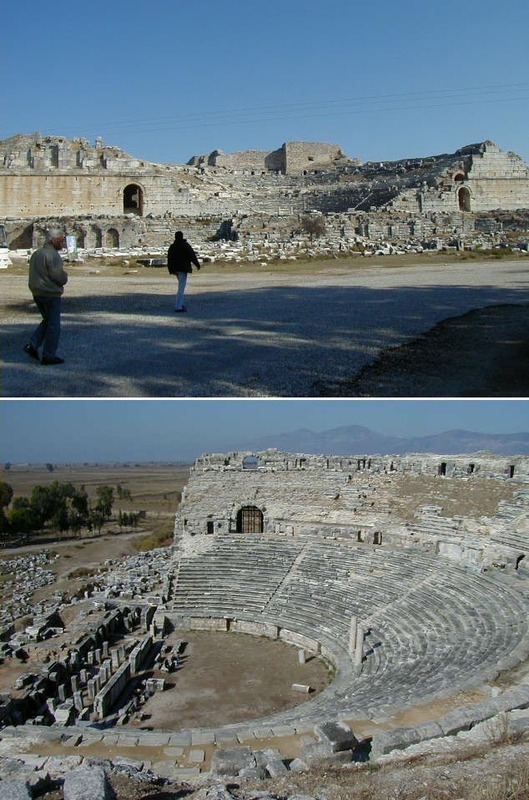 Most of the theaters I'd seen were built into hill sides, following the natural contours of the hills. 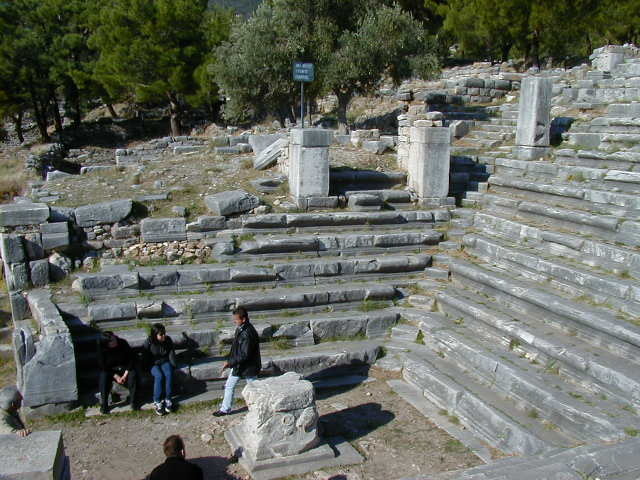 Miletos didn't have a hill convenient, so they built their theater from the ground up. It is massive and looks modern in many ways; if you were to take a modern athletic stadium and cut it in half, it would look something like this. Following the theater pictures is the Ionic Stoa from 50 A.D., built as embellishment for Miletos' processional road, and a view of the city. 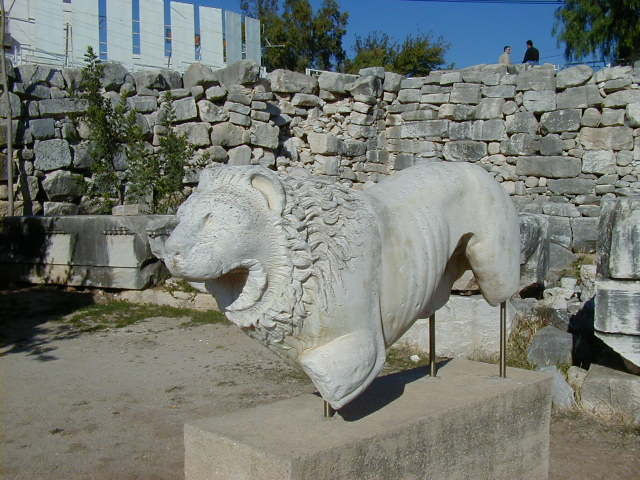 Once again, archaeologists had taken some of the best stuff. 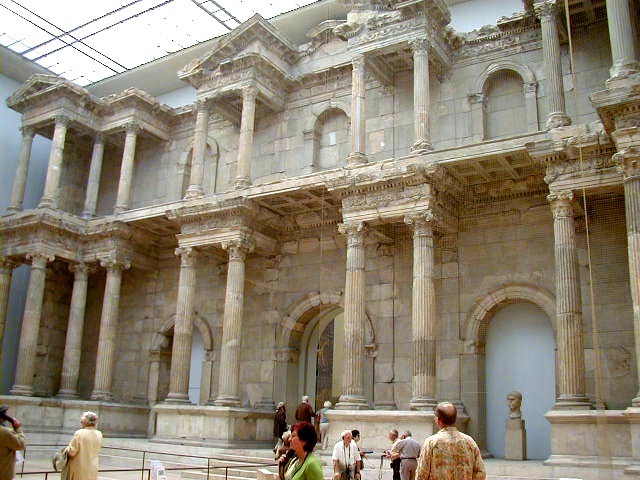 Remember the reconstructed Miletos City Gate in the Pergamon Museum in Berlin? 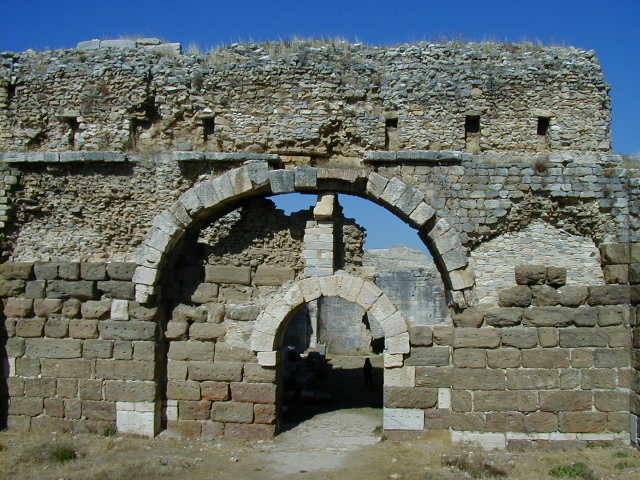 Miletos had the largest baths in Anatolia. 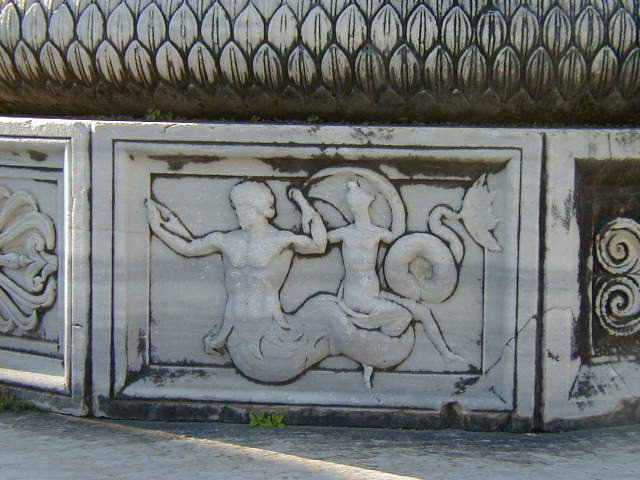 This wasn't because they were exceptionally dirty in Miletos, baths were status symbols. The wealthy citizens of cities would spend obscene sums of money building big ostentatious baths, just to show off. Sort of the way modern cities in America pay obscene sums of taxpayer's money for professional football teams. 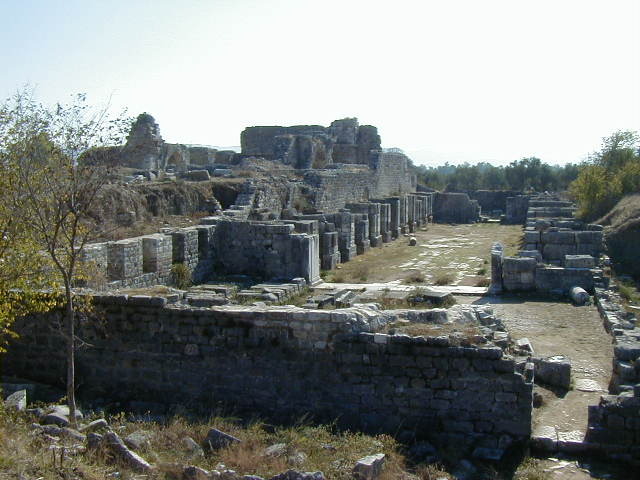 Only the baths were open and free to everyone. Also, the baths wouldn't leave one city after getting a better offer from another. Public baths seem like a much better idea than pro football teams. 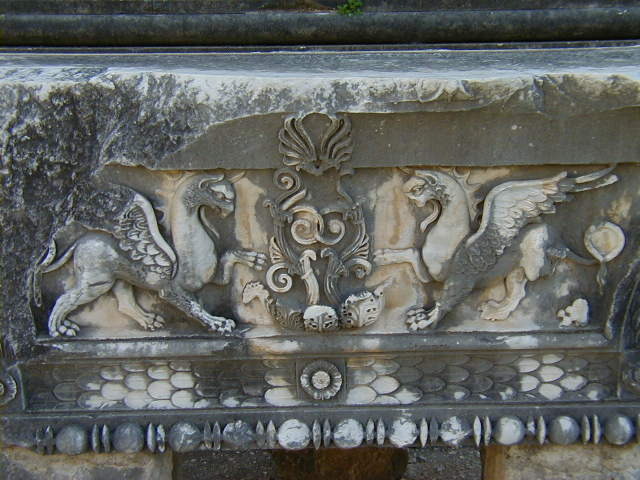 Didyma was the last stop. 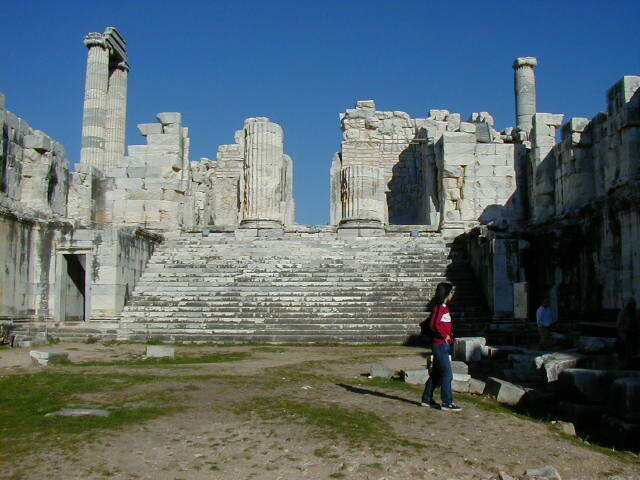 It wasn't a city of significance, but was the site of the Temple of Apollo. 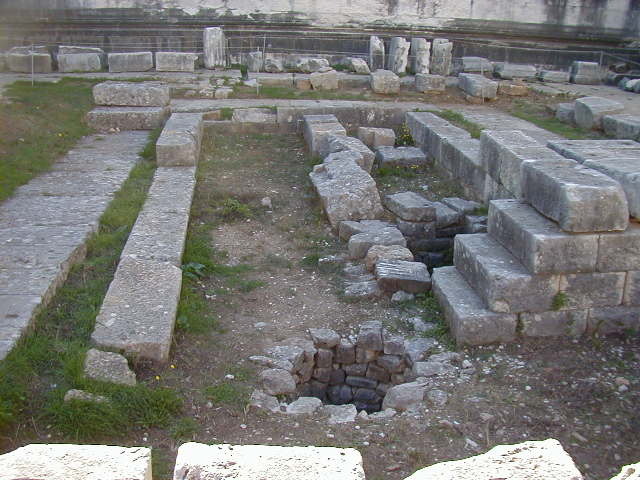 That hole in the ground in the fourth picture was the sacred well used by the priests. 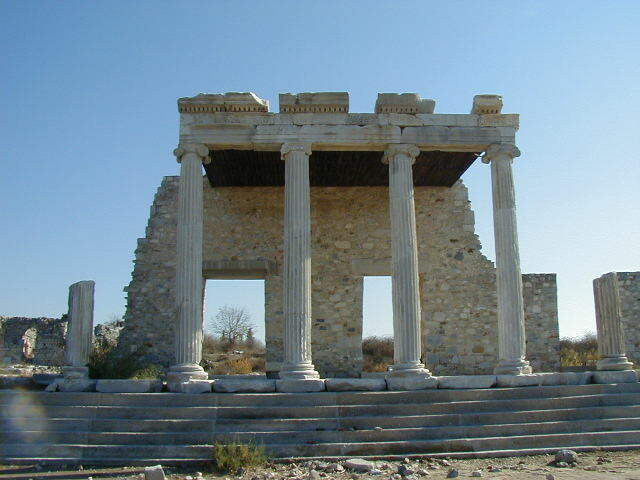 The temple was mostly built in the fourth century B.C., but was begun four hundred years earlier. 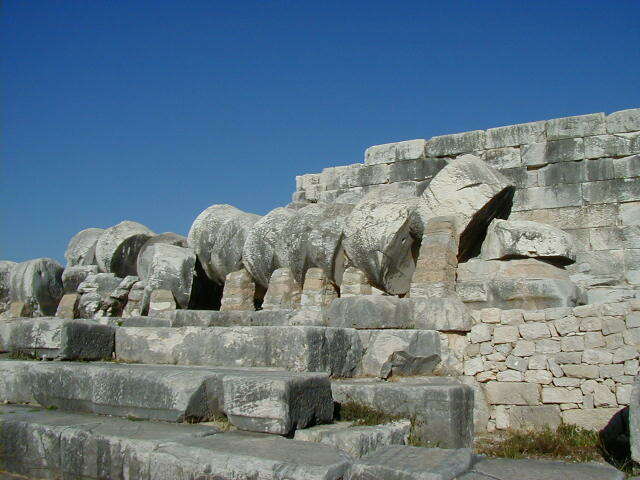 Temples could take as long to build as cathedrals. 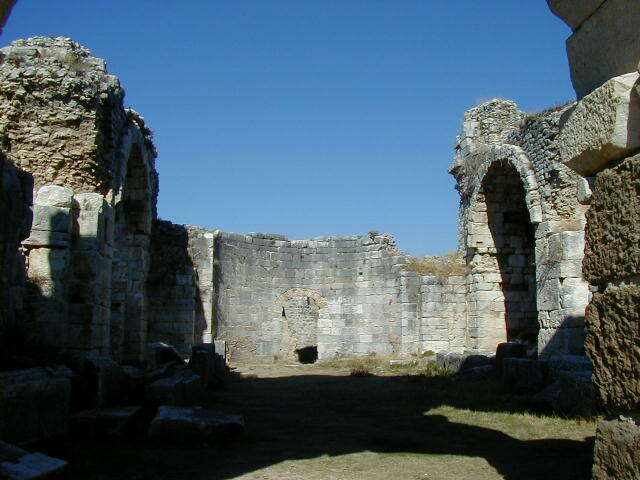 It remained standing for centuries, and I believe it served as a Christian church for a while, after some modifications. Finally a massive earthquake brought it down, but most of the pieces are still there waiting for an industrious person, or maybe a few people, to put it back together. Any takers? This was my last stop in Turkey. I was tempted to continue following the coast as far as the tree houses near Olimpos, then head inland to the rock formations of Cappadocia, but decided to leave them for next time. I was really impressed by Turkey; it is very affordable and interesting. Maybe next time I'll visit during the summer and make it to some of the party towns on the coast the guidebook mentioned. 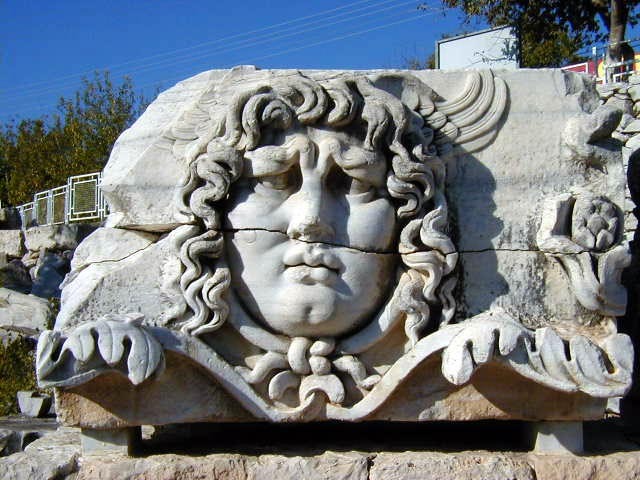 I returned to Selcuk, traded my used Turkey guidebook for a used Mediterranean Europe guidebook, gave my packs of Marlboros (the one's I got in Budapest in case I needed them for a bribe in Romania) to the cook, and went to Kusadasi to catch a ferry to Samos Greece.